I spent my earliest years as a parent very busy, raggedly running around trying to prove myself a good, successful, happy person. And for a while, I thought that was enough. The Do-It-Yourself (DIY) ways of the world we buy into these days will only get us so far. At best, we end up with an exhausting and unsatisfying facade we call life. There are guaranteed to be times when what we do is not enough because that’s the way of this world, and we are human. And then what? Regardless of the current state of our faith, don’t we all hope life is more than that? More than a rat race? Don’t we all want more for our kids? Today, I am especially thankful for my kids. They helped change my convenient, logical perspective on God. I took one look at the gifts I held in my arms, my beautiful babies, tiny fingers and toes—so dependent on me— and I related to God in a way I never had before. God had a Son too, a baby born in a manger. My eyes opened to the life-giving enormity of God’s love for His children, love that isn’t contingent on me but on God’s grace. But I think God’s grace is where many of us, not just parents, are at risk for getting stuck in our faith. We aren’t sure how to respond to God’s grace in our lives. I speak to you not as a parenting expert but as an ordinary, mistake-making parent who realizes God is the expert. He is the guide I need. God invites us into a committed relationship with Him, and we get busy. It’s common to leave God hanging when it comes to our personal responses to Him. God is good for His promises in our lives, not just for one day’s eternity but for this life we are living now. And God promises us that His Son, Jesus, came so that we can have abundant, full life. I want my kids to know and believe in God and His loving promises—not just unpredictably and sometimes but in the details of every single day—His love that’s bigger and more powerful than they will ever be on their own. I want my kids to have an everyday faith that is genuine in truth and their actions. God is the author and giver of life and all good gifts. In Christ, we really do find the purpose and meaning we spend so much time seeking as we grow up. The tricky part is, even with my best efforts, my kids’ life and faith is between them and God. I am not in control of their personal choices at the end of the day. But still, there’s no denying that I significantly influence my kids’ lives through my choices now. 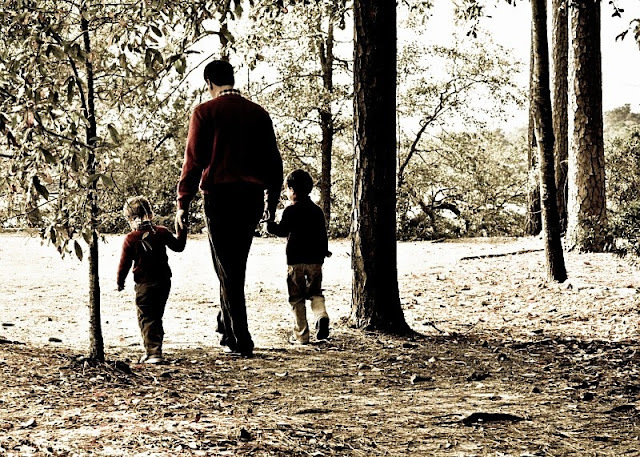 So what does my faith have to do with my parenting? Everything, I am learning. For all of us in the business of impacting kids, there’s good news. Kids don’t need us to be super-humans with picture perfect lives. God is divine, and we are not. No matter where we are in our faith journeys, God will meet us there. Kids need us to let God work in us and through us— growing us along the way by His grace—while they watch. I think that is arguably the most important gift we can give our kids. So in an effort to get us thinking together and talking, here is one simple place to begin that makes all the difference to me. It’s a simple prayer. [these children you have entrusted to me]. One of my pastor’s shared this prayer from another pastor. It’s one she finds helpful before preaching. I find it helpful and adaptable to many situations but especially as I am in the throws of raising my three boys. And so, I am sharing it with you. My intentional time and effort with God allows me to parent from a place of overflow instead of a place of depletion. What we really need and what our kids really need everyday is One and the same-- the Spirit of God pouring into us, filling us, and guiding us. Question: How do you take intentional time to nurture and grow your relationship with God in the midst of parenting? What works?